On Saturday, cyclists from all over Oxfordshire joined in a protest rally to show support for the Save Radley Lakes campaign and to protest about RWE npower’s plans to destroy Thrupp Lake at Radley by turning it into a dump for pulverised fuel ash from Didcot A Power Station. 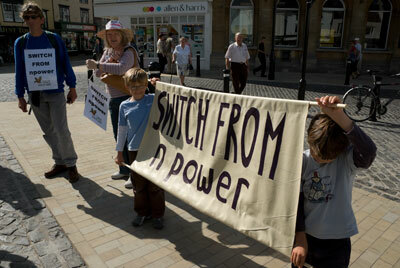 The protest comes on the eve of npower commencing works on the site on Monday. Protestors gathering outside Radley Railway Station on Saturday 15 Sept.
Cyclists came from as far afield as Oxford , Witney and Bicester to assemble at Radley before riding to the threatened lake. 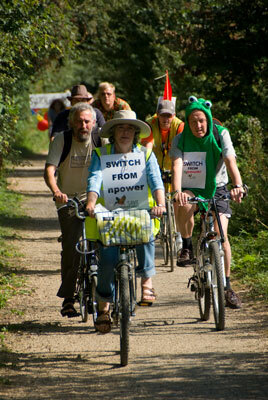 Some people came dressed as frogs and one prominent member of Save Radley Lakes came with her bike bedecked with balloons and with a large sign emblazoned with the words “Switch from npower”, a message that was repeated on the apparel of many of the participants. The protest then rode the SUSTRANS cycleway from Radley to Abingdon. The route passed by npower’s “fortress Sandles”, once a family home on the northern edge of Thrupp Lake , and continued along the shore of the lake. In glorious sunshine and under the watchful eye of a circling Peregrine Falcon – one of the many protected species that inhabit the area – the contingent paused to take in the views across the lake and wonder upon the folly of the commercial imperatives that threaten the destruction of such a beautiful place. 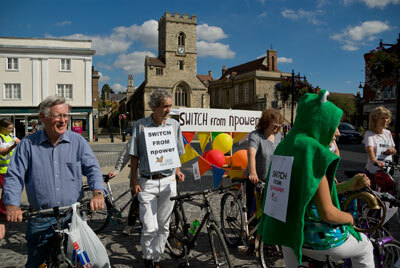 The cycle protest ended in Abingdon Town Square , where the riders were greeted by the Save Radley Lakes Water Vole. The Water Vole, a renowned swimmer, has not yet mastered the art of cycling, but, unlike RWE npower, is known to be a great recycler of everything possible. Jo Cartmell leading the ride along the SUSTRANS cycleway near the lakes.